On 20 July 2016, Mergen (deputy head of T village), and Nakazawa, Nagafuchi (two Japanese environmental scientists) and I gathered in Mergen’s home to discuss the findings of last year’s well water testing project. The two Japanese scientists brought the test results for 33 wells printed on A4 sheets. Professor Nagafuchi explained the overall results to me in Japanese, and I then translated them to Mergen in Mongolian. Results show that Fluoride (F-) and Nitrate (NO3-3) are the two most problematic items in many of the wells exceeding the Chinese national standard for drinking water (Fluoride 85%and Nitrate 30%). Therefore, the Japanese scientists focused on those two items, and provided us a detailed explanation of what F- and NO3-3 are, where they come from, and how they impact on human health. For Mergen and me, it was not easy to fully understand what these explanations sometimes. When language was not sufficient, we communicated with pictures. We planned to report these findings to other villagers a few days later. In order to do this efficiently we created a map displaying concentrations of F- and NO3-3 of each wells. Uchralt Otede made a presentation at the 7th Living Knowledge Conference, 23 Jun 2016, at Dublin Institute of Technology, organised by the International Science Shop Network of Living Knowledge. The conference was funded by the European Commission as part of the EnRRICH project-Enhancing Responsible Research and Innovation through Curricula in Higher Education (detailed information is available from the conference website in the following:http://www.livingknowledge.org/lk7/). In May 2014, I conducted my fieldwork in a small village in Eastern Ujimchin banner of Inner Mongolia. During my fieldtrip, the local herders told me that they were worrying about the quality of their well water because they thought the well may be polluted nearby industrial wastewater. About a year later, I began to plan and implement an action research project to explore the quality of the well water. One of the main strategies in this project is to address villagers’ concerns by connecting local herders with professional scientists and let them interact to discover which wells have problems and find out what kind of problems. Thus, the basic idea of my action research project is similar to some established models of citizen science such as “Co-created Public Participation in Scientific Research Project Model” and “Community Consulting Model”, which are described hereunder. In carrying out this study, I found an interesting phenomenon: both the herders’ kitchen and scientist’s laboratory were acting as places for knowledge production. However, I had never thought about the association between the two until I encountered a herdsman called Chuluu in Inner Mongolia in May 2015. He had brought a bottle of well water to Mergent’s home where I was staying during my fieldwork. He told me that he suspected a problem with his well water when he made milk tea. 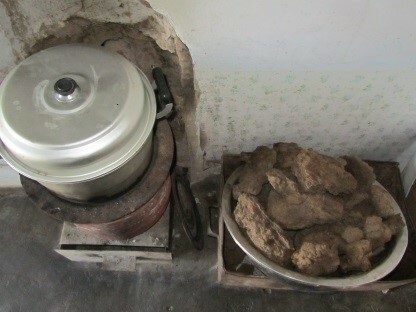 He said that good milk tea is characterized by a harmonious blend of water, tea and milk; however that was not happening in his kitchen when he was using well water. “They are not fused together, suggesting a chemical reaction” he said. 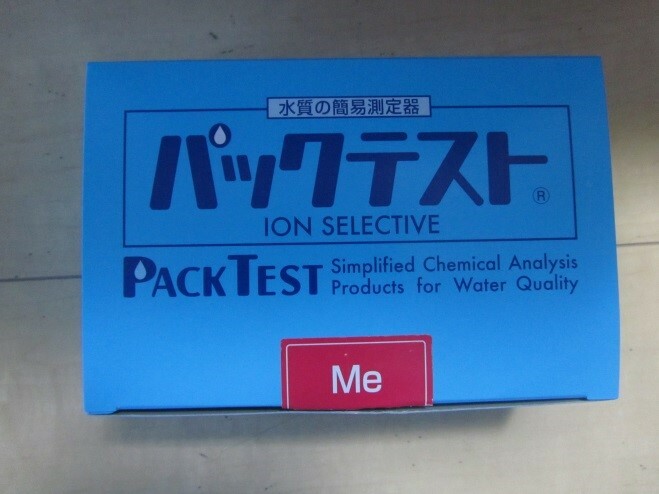 After listening to him talk, I took out PackTest – a simplified chemical analysis kit that I had brought from Japan to check water quality – to start testing the well water quality (see photo 2). The detectors I used were named after COD, NO3(C), SO3(C) and Me. 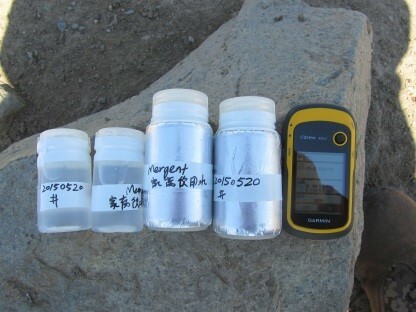 Of these four PackTest detections, the PackTest Me showed that Chuluu’s water sample was significantly contaminated beyond the standard water quality parameters (see photo 3). The PackTest Me tests for five metals: Copper, Zinc, Manganese, Nickel and Cadmium. When the colour of the well water turned red after mixing with the test powder, Chuluu, Mergent’s family and I were a little excited although we all knew it was not a good sign. The result confirmed Chuluu’s suspicions that there was a problem with the well water. So Chuluu invited me to go to the well to take some more water samples to take to Japan for further testing. The well was deep, about eighty metres, dug in 2008. 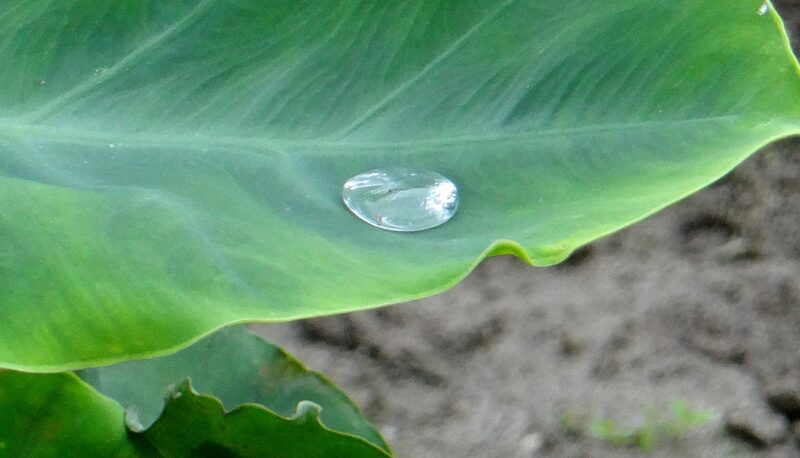 Chuluu said that the well water sometimes had an unpleasant smell. For that reason, his family has not been drinking from the well water since they suspected the deterioration of water quality. Chuluu carries water from his neighbour’s well for the daily needs of his family. However, it requires too much work to do the same for his livestock; his cattle, sheep and goats are still drinking well water. I took water samples from the well and tested it again with PackTest Me: It again indicated excessive amounts of heavy metals. I had taken four sterilised water containers of water from the well, and recorded the geographic location with GPS positioning equipment (see photo 5). In June, I went to visit Professor Osamu Nagafuchi, head of water quality testing lab, at the School of Environmental Science, University of Shiga Prefecture in Japan. I had visited the lab in April 2015 before my fieldwork trip to Inner Mongolia. The main purpose of that visit was to attract their support for my action research project, and to request they share their professional scientific knowledge and technology with local herders in Inner Mongolia and me. They showed deep interest in my research plan and expressed their willingness to share their expertise and equipment for scientific testing. In particular, they voluntarily provided me with four types of PackTest, dozens of plastic bottles for taking water samples, and detailed training on how to test. With their professional support, I was able to bring back dozens of water samples from the small village as a ‘citizen scientist’. 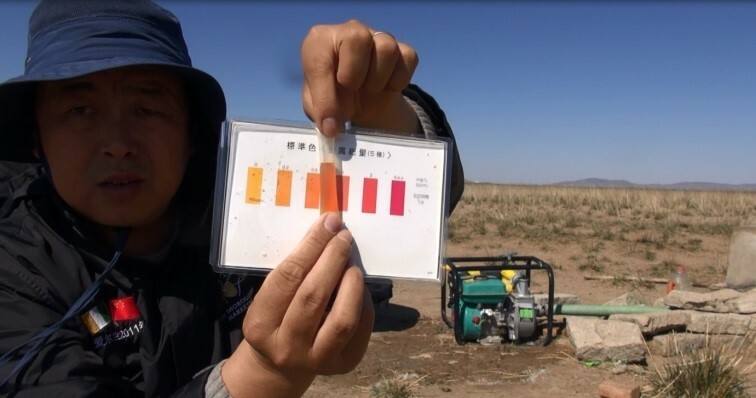 Upon the receipt of the well water samples from Inner Mongolia, the lab members – Nagafuchi, Nakazawa and Yoshida – began testing the quality of the water. I used Arabic numerals to label water samples. Chuluu’s well water sample was No.14. 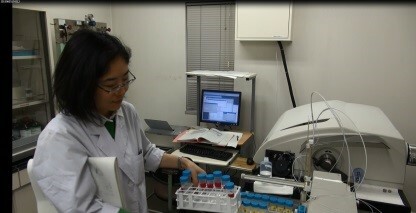 After preparatory work, researcher Nakazawa had placed the sample No.14 together with other samples into a high-performance detection machine (see photo 6). The machine was connected to a computer and a printer. 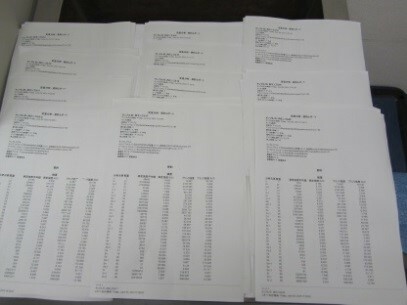 I could not see how the samples were being tested inside the machine; however, about ten minutes later the printer automatically started to print out the data (see photo 7). 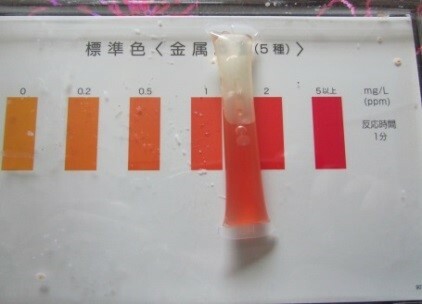 Following a preliminary analysis, Professor Nagafuchi told me that sample No.14 showed excessive manganeser. However, he said that further testing was necessary before drawing a final conclusion. I had to leave before they conducted a second analysis but we arranged to meet in late August to discuss the results.